Renamed after James Allardice, the founder of the distillery, this is GlenDronach's third core range expression. Non chill filtered and with natural colour, it is probably the darkest single malt I've ever encountered. 15YO Revival is probably as dark as Allardice. I used Godard as my movie reference with Revival, so I’ll stick with that theme. 18YO Allardice is strong and even a wee bit rough, yet very sweet and jammy. A mix of masculinity and femininity. So it's very easy to state it as Masculin Feminin. A statement, which would fit Revival as well. This single malt is strong, rich and dark, full of sherry notes. Almost as good as Revival, which still remains as my favorite sherry matured non peated whisky so far. Nose: Strong varnish notes at the start, with hints of oak and Demerara sugar. Dry like rum. Dark and fruity with sherry notes and sulphur. Water makes the oak notes stronger. Taste: Very thick body. Dark sherry and some fruit candy notes. Plummy jam with cocoa. Water makes it smooth and brings up raisins and orange marmalade. Finish: Very long aftertaste, bitter red berries and menthol. Slightly dry and syrupy. Figs and some warming spices. Water adds smoothness again, yet making the menthol notes stronger. Balance: Good dram in balance. Sweet and strong sherry whisky. Adding water makes it better. Thanks for the input Rantavahti. The car comparison was amusing. Have had pretty good experience with Volvo in a road trip from Toronto to Montreal. Anyway I have had a fair sized dram of Macallan 18 from a friend back in the day when I had little experience and it was great for me. Anyway his bottle was stolen and the restaurants and whisky bars want to charge like $50 for one shot so quite hesitant to pay that much. Multiedit currently been spending a fair bit on whisky and come from humble beginnings so Macallan 18 bottle would be a bit of splurge. As mentioned by others I could split the price with friends or sell them at cost a shot.The best price I have seen comes to about $300 Cdn and have to use an American connection. Need to network more in my area because I know have a couple bottles that very trade worthy. Wish we could trade as easily as Europe in Canada or even have access to Master of Malt. Our government must make a fair from alcohol tax and don't want to give up their monopoly. I know in Russia their liquor taxes make quite a bit for their government. Anyway seriously off subject. To sum it up, if I can acquire couple more Revivals for decent price I will. They are a rare breed in BC. Have family on the east coast, but have used them recently quite a bit and they are slightly concerned with my spending on alcohol. Jokes!! The difference between Revival as pointed out by Multiedit is almost double. This is a synopsis I would agree with. After first opening it would have only given it about an 85 but now definitely now more in that 88 range. If a bottle ofthe Revival, Allardice or Parliament was offered to you which would you choose and is Macallan 18 that much more superior than 2 bottles of any these? It hard for me to believe that Mac 18 is worth double but eh just getting into whisky. After analyzing countless blogs about this matter it seems that pre-1992 Macallan 18 are excellent, but pretty much missed that boat(also Macallan Cask Strength). Anyway will drown my sorrows in a fine dram of Allardice. Cheers!! Still, there’s enough charm here. First, the prune juice nose. No, I wouldn’t want all whisky to smell like this, but it works here. Next there’s the rich, silky mouthfeel, which fools us into thinking it’s a thicker whisky. Finally, the dark, fruity character has both depth and intensity. It’s certainly the darkest of the regular ‘Dronachs, which throws people off, I’m sure. I do think it has a place in the range, although it’s too heavy to come back to with much frequency. Solid, but no legend, admittedly. Okay, I reeeaaally like this stuff. I've had many bottles of the 15 over the years, but finally decided to buy a bottle each of the 15 and 18 to do a HTH over several months. I won't go into detail describing it as you have done quite well. When first opened, the 15 was preferable, both on the nose and palate. However, over the months, the 18 really opened up into a lucious, full-flavored darkly sherried delight. It really shouldn't be compared to the 15, as the profile is very different, being more comparable to (but better than) Dalmore 15. I would love to keep both on hand since they are so different and great, but the much higher price for the 18 makes that unlikely. @Taco, thanks for your two cents. Yeah I can see someone liking this a lot. I don’t dislike it; I just find it heavy to come back to very often. My good friend thoroughly disagrees with me as well. He loves it, and can go through a bottle of Allardice much quicker than I can. Personally I prefer a lighter sherried touch, that’s just the kind of palate I have. Among my favourite Dronachs is the 8 year old Octarine, which is matured in sherry AND bourbon. It’s the opposite of the dark, luscious, full-flavoured character of the 18. As for the Dalmore 15, I can see where you’re coming from in terms of similarities. Dark, brooding sherry. I’d say it’s closer still to Dronach’s Platinum 16, as I mentioned above. That might be one to look out for if it’s available to you. I actually like it a little more than the Allardice. Nose.. It has a lovely dreamy aroma of dates, figs, candied oranges and spices, I could sit and nose this for the rest of the evening. Palate.. Dark chocolate and cherry come gushing into your mouth, lovely citrus flavours step up followed by ginger and other spices. Finish… It does eventually finish and that is a shame, but it leaves the memory of a wonderfully rich spicy dram. Thoughts.. This is another dram that can take you on s journey, you end up in one of those nomadic tents surrounded by dates and figs, the air is full of eastern promise.. What more do you want from a drink.. I do think the 15 is special but not sure if it will remain the same once they actually use a 15 yo whisky, as we know the 15 is actually an older whisky at the moment. This 18 is as is.. It is good, and it can bring a smile to the face.. This one is not bad. I tried a 50 cc bottle a while back. I think I much preferred the 15 YO revival. 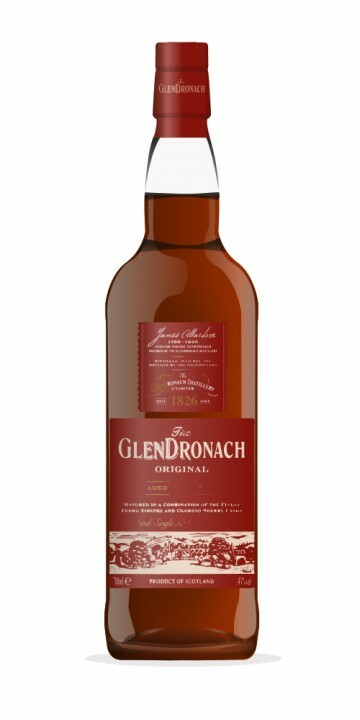 Glendronach distillery is located near Forgue, in the vicinity of Huntley, Aberdeenshire, and was founded in 1826 by Glendronach Distillery Co., a partnership headed by James Allardes (often referred to as Allardice). Shortly after its foundation the distillery was destroyed by a fire, and as a consequence several people from the industry got involved, among them ‘Captain’ Charles Grant (the younger son of William Grant of Glenfiddich distillery). Glendronach remained under control of the Grant family until 1960 when George Grey Grant sold it to Teachers and Sons Ltd. who in 1976 were taken over by Allied Breweries (later known as Allied Domecq). In 1996 the distillery was mothballed but production resumed in 2002. Ownership of the distillery changed again in 2005 when Allied Domecq were acquired by Chivas Brothers (Pernod Richard); during the same year the distillery closed to rebuild from coal to indirect firing by steam and reopened in September. In 2008 Pernod Richard sold the distillery to the owners of BenRiach distillery, led by Billy Walker and his partners. This 18-year old expression, named after one of the original distillery’s founders, was relaunched in 2009 and was 100% matured in Oloroso sherry casks. The nose is rich and fruity. Notes of sherry and rubber come first, followed by oranges and milk chocolate, with a layer of liquorice in between. Later on there are coffee and leather flavours. The palate is medium-bodied and silky. There now is distinct wood spice, and orange as well as chocolate flavours are back, accompanied by notes of coffee and nuts. The finish is of medium length and pleasantly warming. Wood spice is now quite prominent, with ginger making an appearance and followed by a touch of green tea. This is a solid sherried single malt – but not much else. In particular I missed the balanced and silky palate of similar expressions from other distilleries. Overall, the wood spice influence dominates all other flavours, which should not be the case. The 15-year old from the distillery’s core range provides better value for money. No sign of the 15 here in BC, but at under $70 and 43% I keep going back to the 12 yr. old Original for a good heavily sherried malt. The 18 is just a stupid price here and won't ever be in my cabinet. I would go further and say regardless of price, I prefer the 15 year old yo the 18 year old. I earlier reviewed GlenDronach's Octarine, 12yo, and 15yo; I tasted this 18yo especially against the 15yo and 21yo Parliament. This 18yo stands out as the spiciest (which might be why I rate it lower than the 15&21). Nose: Dates and tingling clove enveloped in leather. Palate: Wonderful entrance of raisin and dry spicy molasses, with tannins of walnut/cocoa. These tannins quickly build to spices of clove and ginger, hot (if without water) but not overly. Some raisin rounds out rest of mouth. Finish: Ginger and clove again prickle the tongue; walnut breathes out the throat; and the sides feel slightly dried but rescued by some raisiny sensation, stirred up by the tongue. This is about confluence of light raisin sensation against the more tannic spices. It works, and I suspect it would be better enjoyed by you spice-lovers out there. After some oxidation, the heat of the ginger spice picks up too much for me though. I find that a bit of water is necessary to round it out in any case; otherwise it scores 3 points lower. Compared to GlenDronach’s 15yo, this 18yo is spicier (clove) and more molasses; less sweetly-chewy melted chocolate; so, more refined and less sweet. (It's certainly more robust and fuller than the 12yo, and quite different in character from the Octarine-- so I will not compare with these.) It is much closer to the 21yo Parliament; the main differences are that the Parliament is not quite as spicy or leathery, and rather introduces some intriguing fruitier tones. For these reasons, I just can't appreciate the 18yo to the same degree as the 15/21, even though I enjoyed it. Within other distilleries, I think Glengoyne 21 is the most obvious comparison, but this ‘Dronach is sweeter (more raisiny) and less woody. (I do need to re-evaluate ‘Goyne though, as it has been a couple of years since I last tasted it.) The leather and date tones also reminded me of an unpeated version of the more recent (ca. 2013, not the earlier versions) Bowmore Laimrig. I have to say I preferred the 15 year old revival myself. But I haven't tried those drams in a long time... Too many other new ones to try. The 18 year old Allardice named after the founder James Allardice who made a name for GlenDronach through a rather unorthodox method of word of mouth. After having no luck at a whiksy fair or some such occasion, he ran into some ladies of the night to whom he gave some whisky, their response was thoroughly positive and soon word spread of this heavily sherried highlander. Nose: smoked ham, medium dark chocolate, spicy Christmas cake, ginger, fudge and some leather. Pallet: immediately there is strong cocoa, toffee, some buttery brulee, darker chocolate than the nose and with time some plum. I'm afraid the title says it all, this whisky really lacks dimension, which i believe the 12 and especially the 15 have. Its decent, there is nothing wrong with it but i expected more. This one was sampled at the bar and I let the bartender pick out my last one to be sampled for the evening. Lucky me has a good enough memory that I can think about one and almost taste it right then and there (especially Caol Ila 12). This one has a very heavy sherry taste that is not overly sweet. Smoke is just about absent. The 18 years of aging really showed, and I was the most impressed with this one over all that I had tried that day. I figured that is should cost about $80-$90 US and rate in the nineties, but when I checked later, I saw that it costs about $120 US. Being slightly over priced drops the score down to 89 for me. Try the 12...I liked it better :) For 50.00, it is a mouth full of chewy chocolate. A real sweetie. The 15 is great too, but it is running around 80.00 where I live. As sherry-monsters go I don't think I can think of anything to beat Glendronach. Loved the soft gentleness of the 15yo, now 'upgrading' to the 18yo. The palate continues with the fruit flavours but the spiciness is more apparent now. Definite woody astringency which is far more noticeable than in the 15yo, (but in a good way). The finish is shorter and more bitter than I expected but doesn't detract from a decent full-powered sherry monster. It's been a bit of time since I tried the 15 but from memory I think I just preferred it over the 18yo. Whilst the 18 is a superb whisky I think the 15yo just beats it in terms of price/value ratio. Close call though. Did you like this more or less than the 15 "Revival?" This 18 Year Old GlenDronach was named after its founder, James Allardice, who preferred chasing women in London than taking care of his distillery. It matured for 18 years on oloroso sherry casks. I tasted the most recent bottling, Lot 5, from 2010. It is very aromatic and fruity, but also very herbal and flowery. I get some red fruit, elderberries and espresso, but mostly herbs like basil and thyme, maybe even some chervil, come through. Some roasted nuts, walnuts, sweet malt and roses. Balsamico as well, but not too much. Praliné. It has an edge of struck matches, but it does not become sulphury, something I did get on the 15 Year Old Revival. Becomes better if you leave it for a while. Pretty oily on the palate, but very sharp. I am probably kicking in an open door when I say the influence of the sherry cask is big. It reminds me somewhat of grenadine. Nutmeg and mostly ginger. Slightly bitter towards the end. The finish is medium to long, striving but not quite achieving a balance between the berries and the oak. A nice Speysider in general and a good GlenDronach in particular. Better than the Revival, if not much. Right up front, when I say deceiving, I mean that this whisky does not deliver what I feel is promised by its position as a distillery's 18 YO expression. How can a whisky whose ABV is 3% higher than its 12YO brother deliver such watered down tastes? And yet, that is what the Allerdice delivers. Nose: Absolutely zero alcohol burn. I am sniffing strong enough to snort and all I get is the faintest of sherry and chocolate. The extent to which I have to work for even this, is frankly, exhausting. Taste: A demanding swish finally releases some numbing alcohol, but after the burn fades (quickly) it leaves a dry bitterness. Unsweetened dark chocolate, Tannins and oak. Finish is longs, but not entirely pleasant. Dark unsweetened chocolate. Bitter. Mouthfeel is watery. A quick sip yields a more concentrated flavor profile than I get from swishing. Cocoa, bitter raw honey, dry, then it is gone. The degree to which the 12YO expression outshines this whisky is simply stunning. The Original is more expressive in every way, even at 43%. I eagerly await the opportunity to try the much lauded 15YO Revivial, but I will never buy this whisky again. Price comparison: 12YO 54.00. 18YO 114.00. Revisiting Glendronach 18. Here we are at only a couple inches left in the bottle. I have been using Private Reserve on most of my scotches, and it seems to work well on most. The Glendronach nose comes through much better now. Quite a bit of caramel, not as much chocolate as the 12YO. A bit of somewhat off putting sourness, but still, much more to the nose than when I first opened the bottle. The alcohol is still much more noticeable in taste. Neither the 12YO, nor the 15YO have this problem. I just cannot taste the age on this whisky. There is no smoothness. It just does not work for me. I will say that being open for some time has improved this bottle. I would still buy either the 12YO or the 15YO before this, but I would bump up the score a couple of points as of this tasting. Still, does NOT justify the price, and in no way makes me want to try the Parliament. Nose; Mild sherry, chocolate orange, very sweet. Kind of spendy for my "daily dram." Way to go, Sharkk. You are living well . . . A bottle runs $130 in Oregon, USA. Maybe it's cheaper in your neck of the woods. . . or maybe not. Either way, bravo, you big spender, you. Why not drink 30 year olds as a daily dram, or 40 for that matter! As they used to say on Happy Days, if the wallet fits in your back pocket, sit on it. A top notch whisky from one of the best distilleries out there. Great as a daily dram. Being partial to anything with sherry I quite eagerly went in for my first nose. The smell is autumn. All around me are scattered dry leaves gentling rustling in the wind. As I go foraging through ankle deep foliage I find sweet bananas and dark berries glistening with a sherry coat. I look up and nestled in the branches of a dry oak tree is a wooden box filled with dark chocolates and butterscotch. As I look down I see in my hands a bowl of fudge sprinkled with fruits while all around me is the smell of dry oak trees. I tipped the glass back expecting a sugar rush of sherry and dark berries and I wasn't wrong. But before I could get my head around the initial flavors the dry oak kicked in and arrested what was going to be a great first impression. As I pressed on I began to detect bits of dark chocolate, citrus and walnuts in the mix. Unfortunately, though, as I tried to savor the new flavors my journey was abruptly ended with the bold arrival of cinnamon spices. Nice review, I prefer there 15yo revival to their 18yo. Though if you ever get another bottle from this distillery you have got to get one of their good single cask bottles, absolutely blows all of there standard range whisky's away and if you manage to get one of their really good single cask bottles it's among some of the best sherry whisky's ever. @Jason0142 Thanks for the recommendation. Will look up some single cask expressions from Glendronach. Nose: Evidence of the Olorosso sherry maturation is apparent yet surprisingly restrained, allowing for fruit bubblegum and cherry coke to mix as equal citizens with the creme brûlée, marzipan and white chocolate. Tobacco, sweet mint and mocha coffee add a bitter edge to the air that keeps us on our toes and prevents us from fully curling up in the sherry blanket. Taste: Things get a little richer and less complex on the palate, with a pampering christmas cake being served up with toffee, chocolate and ginger. The bitter coffee remains however, once again keeping our eyes firmly open and resisting the sherry sedation. Finish: Eventually however the sherry will out. Toffee fudge and buttermints linger in the mouth, bathing in custard, cherry coke and strawberry liquorice. Very comfortable and smooth, yet less intriguing perhaps than the nose. Balance: A curious paradox. As you spend more time with this whisky, it seems to grow in weight and intensity of flavour, yet in a way that condenses and contains the flavour, thus losing the wider complexity of the nose. That said, the more richly compact palate and finish are very pleasant to discover, however one can't help missing some of the more unpredictable character of the nose. Forget the 12 and the 15, not because they are better or otherwise than the 18, but because this is the 18. Comparisons are futile. This whisky is heavily influenced by it's 18 years in Oloroso Sherry Casks. There is a creamyness that could be attributed to the sweet and creamy Amorosa Sherry which the casks may have once nurtured. The effect is damned near perfection. The palate: is deep and rich with a sweet nutty and creamy sherry, there is delicious tiramisu taking you all the way to the end which leaves you wanting more of that moorish of whiskies. You really do feel as though you have had something special. There is glow deep down inside inducing a silent smiling contentment that refuses to be interupted.